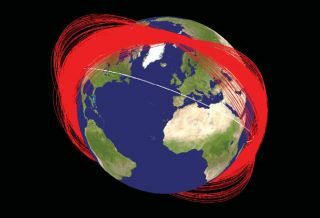 Orbits of debris generated one month after a 2007 Chinese anti-satellite test; the white orbit represents the International Space Station. In May 2014, Russia launched a mystery object that some experts say could be an anti-satellite weapon. Scientists sniffed the atmosphere of a comet, found out that Jupiter's Great Red Spot owes its color to a wicked sunburn, and a Mars rover took some great pictures of Martian rocks last week. Here are Space.com's picks for our best stories of the week. Nov. 17 - The European Space Agency's Rosetta orbiter captured some amazing images of the Philae lander just after it bounced during it Nov. 12 landing on Comet 67P/C-G. The incredible series of photos show the washing machine-sized lander in its various positions on and just above the comet's surface. Nov. 17 - Crewmembers on the International Space Station have installed the orbiting outpost's first 3D printer, and it's in great working order, according to NASA. Made in Space built the printer, which arrived on the space station in September. Nov. 17 - The huge Great Red Spot on Jupiter's face actually owes its color to a cosmic "sunburn," scientists announced this week. Jupiter's upper atmosphere becomes coppery when penetrated by sunlight. At the moment, the red spot is about the width of two Earths. Nov. 19 - An amazing image from the European Southern Observatory shows an incredible web of quasars spread across billions of light-years. Scientists have found that the bright galaxies are actually aligned with one another, even though huge distances separate them. NEXT: Russian Mystery Object Actually a Space Weapon? Russian Mystery Object Actually a Space Weapon? Nov. 19 - Some people are speculating that a Russian object launched earlier this year might be some kind of space weapon. Its odd orbital maneuvers are raising suspicions, according to the Financial Times. Nov. 19 - The new organization, Lunar Mission One, plans to dig at least 65 feet into the ground at the moon's south pole in 2024. The group hopes to gather more science about how the moon and Earth formed early in the solar system's history. Nov. 19 - Scientists think they may have discovered a black hole that was ejected from its host dwarf galaxy and flung out into space after a collision. It's also possible that the "black hole" is just a strange kind of supernova. Nov. 19 - Europe's Philae lander seems to have sniffed out organic molecules during its bouncy landing on Comet 67P/C-G. Scientists still have to analyze exactly what organic molecules the lander found during it short time with power on the icy body millions of miles from Earth. NEXT: G2 Object Identified … But Was It? G2 Object Identified … But Was It? Nov. 19 - Astronomers watched with bated breath as a mysterious cloud of gas called G2 moved closer and closer to the massive black hole at the Milky Way's center. Scientists expected G2 to fall into the black hole this year, however, it survived its close brush with the galaxy's center leading some researchers to think that the object was actually a star in disguise. But some people aren't convinced. Nov. 20 - NASA's Mars rover Curiosity is at the base of Mount Sharp and taking a long look at some of the first rocks it has seen there.